Welcome back to our Give Thanks Blog Hop!! I'm so pleased that you're joining us for our second day. I have another project for you to see. This is hanging in my house. Our guests that are coming Thanksgiving Day haven't seen it yet. Spoiler Alert!!!! Gramma & Grandpa Steve Spoiler Alert!! Ok, not that they're going to listen to that...hint hint... Gramma is probably peeking now. I am glad that many of you left me comments on my album and the tradition we'll have in our family. I know this will bring many fun memories. Now for the formalities ~ If you've stopped in to say hello and see what fun I'm up to ... great having you!!! I would love for you to see the fun of our hop as well. I'd love it if you went to our Hostess, Denise at VinDeeLoo's This 'n That. This way you don't miss anything from the beginning. If you've been hopping along with us and have arrived here from Carley at The Real iCarley you're in the right place. WELCOME!!!! Now for the fun!!! 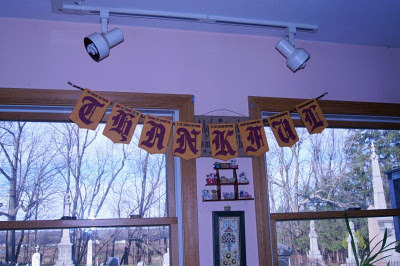 I decided to make a banner that says "Thankful". I used B is for Boy Cricut Cartridge for the banner pieces which are cut at 6.5" and the lettering came from Blackletter Cricut Cartridge which was cut at 4.5" for each letter then centered on the banner pieces. The ribbon was from my ribbon stash. I just love it because it has leaves on it. I almost fed it through to the back, but when I actually started to do it I goofed lol ... and put it through the front. I looked and thought this looked rather neat. I also liked that the letters stayed in place more when I moved them along the ribbon. I'll be storing this away and using it in years to come. I apologize for the lighting in the picture. We had a good sunny day and I asked my husband to help if he wouldn't mind with the picture. He said he'd do what he could. I wish you could see just how vibrant the colors are. I used the linen paper stack Mango, Berry, Banana. I just love how it looks in my kitchen. I will be adding a few more elements then will get another photograph of that as well. Here is the banner pardon the stones in the background ~ comes with the location of our home ~ yes, in the middle of a cemetery. Now before you go ~ I do want to thank you for stopping by. I hope you all have a wonderful week and wonderful Thanksgiving with your families. Now I will let you hop off to Ashley at Made Especially For You. Thank you again for your wonderful comments. I really appreciate them. I keep saying I want to do a banner and never do. :) I really need to make one! Thank you for being a stop in this hop! Happy Thanksgiving!